THE November Player Transfers Period has concluded. Transfers will re-open on February 1st. 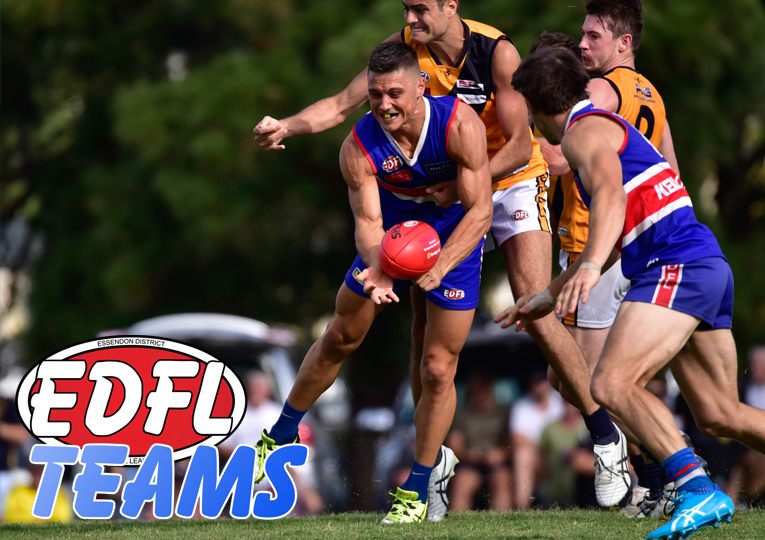 Throughout November we saw numerous EDFL clubs announce some key signings, while others kept their cards close to their chest. Scroll down to see how this year’s November Transfers Period played out. The others include Michael Kilty (Diggers Rest), Jeremy Murphy (St Albans), Lachlan Baddeley (St Albans) and Michael Spooner (Thomastown). Drake made this year's @EssendonFord Division 1 Team of the Year and is a premiership player with West Coburg, while Komaitai is a tall with prior experience at the Western Jets and Deer Park. ESSENDON Ford Division 1 contender Craigieburn has made a big move after lodging transfers for five quality players. Among them are 2017 Jacana premiership duo, Billy Morrison and Jacob Austin, Wallan's Jesse Davies and Mallee Eagles star pair, Steven Boyall and Corey Viani. Morrison, who made this year's Essendon Ford Division 1 Team of the Year and was Jacana's best-on-ground medal winner in the 2017 Strathmore Community Bank Division 2 Grand Final, has chosen to stay in the EDFL's second tier and re-unite with former coach, Lance Whitnall. Whitnall coached Morrison at Glenroy. Austin was also part of Jacana's premiership 22. 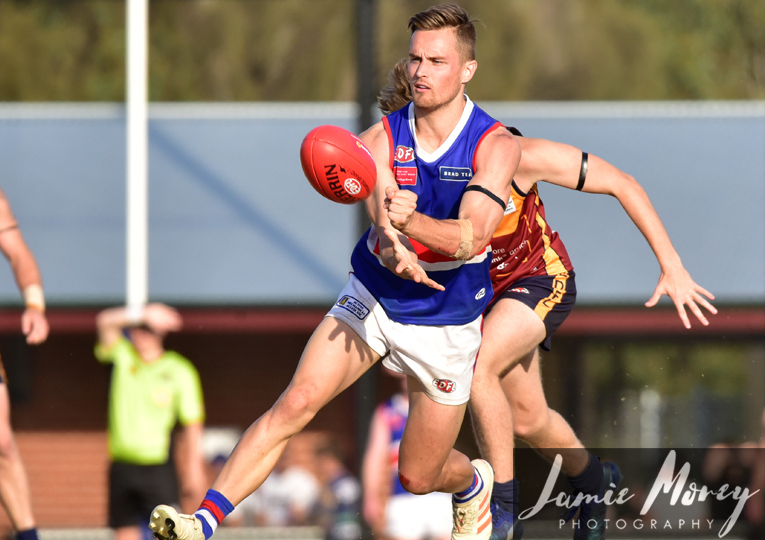 Davies has returned to DS Aitken Reserve after a stellar 2018 season with Wallan, where he claimed the RDFL's Bowen Medal. The talented 27-year-old midfielder was part of Craigieburn's 2016 Essendon Ford Division 1 premiership win over Tullamarine. Finally, Craigieburn will look to welcome back both Steven Boyall and Corey Viani, however both initial transfer requests have been denied by the Mallee Eagles. Both players are former Craigieburn juniors and have been two of the star players of the Central Murray league since moving across from Broadford in 2017. MARIBYRNONG Park has lodged its first transfer for November with North Melbourne VFL-listed tall forward Brandon Ryan joining its ranks. A knee complaint kept Ryan away from the action for much of 2018 and is yet to make his VFL debut. However, the 198cm key position prospect has been a fine servant for Geelong West in the Geelong league since 2017, kicking 28 goals from 24 appearances. Prior to that, the 21-year-old played most of his junior football at Barwon Heads but did play Under 10s football with Aberfeldie. ANTHONY Liberatore will be a handy addition to Tullamarine's midfield stocks in 2019, re-joining the club after spending 2018 with Launceston in the Tasmanian State League. Liberatore was an important cog in Tullamarine's 2016 line-up and could only play five games in 2017 due to VFL commitments with Werribee. He joins Hillside's Joel Bonnici, who will move across to Leo Dineen Reserve after five seasons as a senior regular down back for the Sharks. Bonnici was Hillside's captain in 2018. ABERFELDIE has lodged the first major set of EDFL Women's transfers of the current window, picking up three of Pascoe Vale's star players. Among them are 2018 EDFL Women's Leading Goal Kicker, Siobhan Carlton, Team of the Year defender Sian Eddington and premiership player, Sarah Larkings. The trio were all crucial players in Pascoe Vale's undefeated premiership run this year. 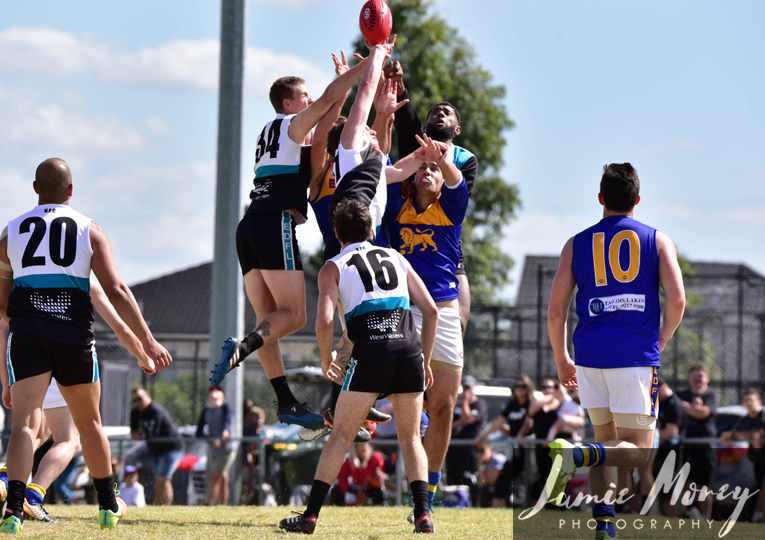 NEW East Keilor coach Pat Christofi last week told essendondfl.com.au to look out for numerous incoming transfers on the opening day of the November window and yesterday, the Cougars did not disappoint. 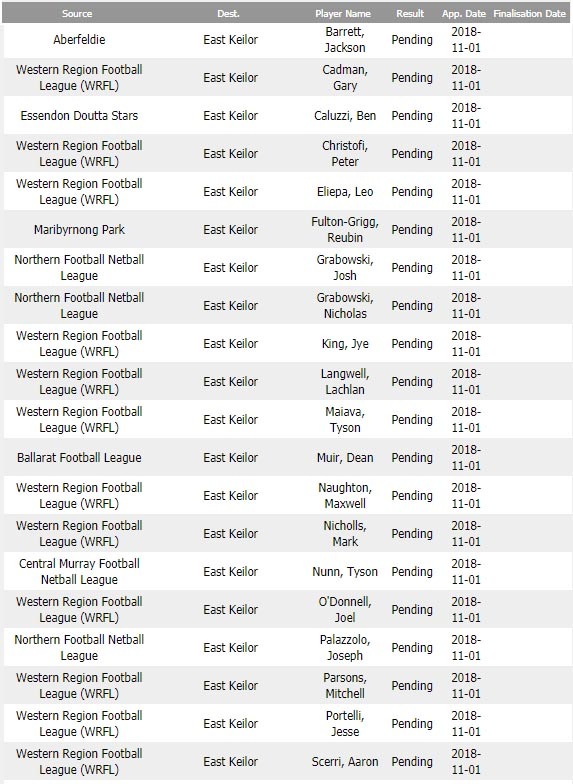 East Keilor yesterday lodged a total of 20 transfers and is promising even more to come. Among the 20 names listed are 2017 Bundoora premiership trio, Josh Grabowski, Nick Grabowski and Joseph Palazzolo. The Grabowski brothers have played in the EDFL with Avondale Heights previously. Also among some of the more familiar names are former Aberfeldie duo, Lachie Langwell and Jackson Barrett. Meanwhile, Airport West has begun working on its plans to be competitive in its first year back up in Strathmore Community Bank Premier Division. The Eagles lodged six transfers overnight, including Anthony Daw and Duom Dawam (Wyndhamvale), Curtis Schultz and Josh Kanellos (Sunbury Kangaroos), Anthony Aloi (Hillside) and Nick Zoccali (Essendon Doutta Stars). It was from Wyndhamvale where Airport West last year re-acquired gun wingman Bior Malual (2018 David McWilliam Medallist and Essendon Ford Division 1 Team of the Year member). Aloi last played with Airport West in 2015, having since had stints at Greenvale and Hillside, while Schultz also returns to the club after spending three years with Sunbury.
.@westy_tigers_fc has suffered an #EDFLTransfers blow this evening with experienced pair Justin Taylor and Brad Sutcliffe set to return to Port Melbourne Colts after two seasons with the Tigers. 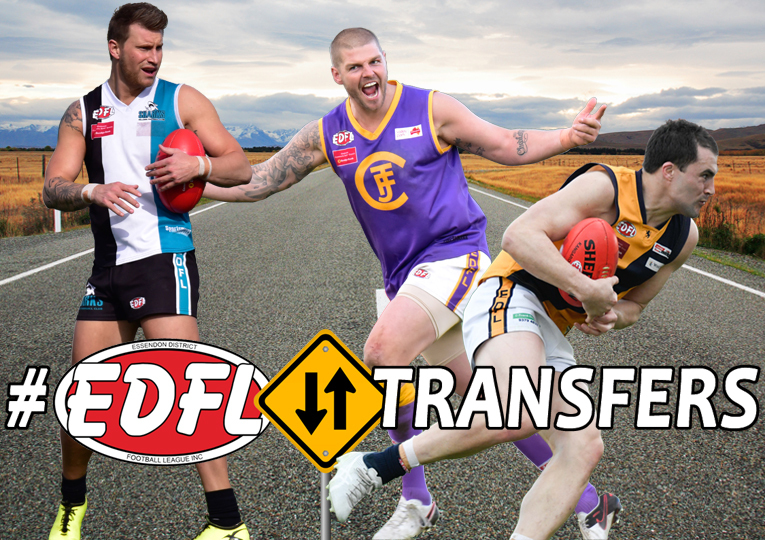 In 2017, Taylor finished runner-up in the Hutchison Medal.
.@MooneeValleyFC has lodged a transfer for another former @KPDevils player, with Brett Thomas' name appearing on #EDFLTransfers this morning. JARYD Cachia, Mitch Church and Cameron Cloke are expected to be among the big names to emerge early with EDFL Transfers opening today. Aberfeldie has announced Cachia as its freshest high-profile recruit, crossing over from Strathmore. Cachia spent two seasons at Mascoma Street and is one of Strathmore Community Bank Premier Division's premier midfielders, finishing runner-up for the 2017 Reynolds Medal. Meanwhile Westmeadows has re-acquired the services of Mitch Church. The athletic key forward spent Season 2018 with Hillside and kicked 53 goals from 15 games, earning a place in the Essendon Ford Division 1 Team of the Year. Church had previous been with Westmeadows since 2014. Finally, Jacana this week dropped a bombshell onto Strathmore Community Bank Division 2 with the announcement of Cameron Cloke's return to the club. Cloke spent 2017 with the Jags and was a dominant force in Division 2, bagging 127 goals in what turned out to be a premiership-winning campaign. In 2018 Cloke played five games at Hurstbridge, where new Jacana coach, Matthew Huy, served as an assistant.